Last month, scientists at CERN, the prestigious high-energy physics lab in Switzerland, reported that neutrinos might—repeat, might—travel faster than the speed of light. If serious scientists can question Einstein’s theory of relativity, then there must be room for debate about the workings and complexities of the Earth’s atmosphere. If science can discover new truths that supersede old ones, how can we have faith in science? Science adjusts its beliefs based on what’s observed. The WSJ believes, as an article of faith, that climate change cannot be real, so all contradictory observations must be denied. This kind of thinking represents a radical failure of our education system; a failure to teach what science is, and what it isn’t. All I know is 90 percent of the scientists say climate change is occurring. If 90 percent of the oncological community said something was causing cancer we’d listen to them. That’s trusting the process of discovery over dogma. Modern gay people are caught on the horns of the science versus religion debate. On one side is the modern sense of self, our respect for the individual, and acceptance of the validity of each person’s experience. On the other side is traditional Christian teaching that homosexuality is wrong and a sinful choice. Increasingly, scientific evidence comes down on the side of gay identity, with study after study linking biological factors like genetics and hormones to sexuality. Sadly, we’re back in the Medieval conundrum of whether to believe the facts or the “traditional” ways, which makes it a good time to review the story of Galileo. Consider for a moment, the sea. If you didn’t know modern science, how would you explain the tides? We know that water stays level, so why do the oceans rise and fall? This phenomena was so baffling to ancient people they had few explanations, and the question of the tides was the central problem Galileo was trying to solve when he got into trouble. Galileo believed that seeing facts would change opinion. He was wrong. Just as people do today, Galileo’s peers did not let facts stand in their way. They even refused to look into the telescope, their commitment to not knowing was so strong. I love this last one. The ancients often described the sky as a tent thrown over the world at night, and the pinpricks of light are sunlight coming through the gaps in the tent’s fabric. Look up for yourself, try to forget what you know, and then look again. The stars really do look like pinpricks in the dome of the sky where light shines through from behind. Terrible science, beautiful poetry. To Christians of Galileo’s time the earth had to be the center of the universe. The Son of God came to earth, therefore earth must be the center of the universe. To put the sun at the center of the universe was to demote the centrality of Christ. The church forced Galileo to stop talking about his observations. The order was to not think those thoughts, but if he could not achieve that, then not to teach or publish them. In submission, Galileo went silent on the subject for many years, working on other scientific projects, including his famous testing of gravity by throwing various objects off Pisa’s leaning tower. In a cruel twist of fate, it was a new Pope’s encouragement that lead him to write his decisive book, the 500 page Dialogue Concerning the Two Chief World Systems, originally titled Dialogue on the Tides, as it those perplexing tides remained the central focus of inquiry. The proposition that the sun is the center of the world and does not move from its place is absurd and false philosophically and formally heretical, because it is expressly contrary to the Holy Scripture. The proposition that the earth is not the center of the world and immovable, but that it moves, and also with a diurnal motion, is equally absurd and false philosophically, and theologically considered, at least erroneous in faith. To save himself from life in prison, Galileo confessed to heresy and declared he had never believed all that he had believed and taught in his life. In consideration of his confessing, the sentence was commuted to house arrest, and Galileo died nine years later in the farmhouse of his confinement. The church won. 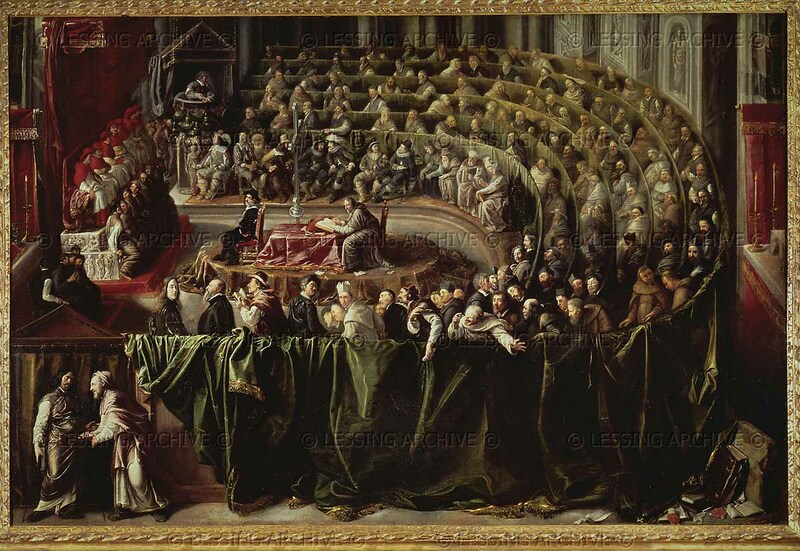 The trial of Galileo was a pivotal moment when truth was breaking through and the power structure quaked. Galileo was himself a believer. He tried to argue that one could believe the Bible as metaphorical truth while still seeing the truths of our planet. But the church said no, the Bible’s cosmology is literal truth. Truth was God’s word, not observable facts, and better not to look through the telescope. There are modern people who will not look at the science of homosexuality. They already know the truth, as the church has told it to them. But as Galileo is reported to have muttered after submitting to the church’s truth: “Eppur si muove.” And yet it moves.